With the holidays coming and going my focus, of course, has been on creating and preparing dishes that could be part of a holiday meal. I mean, yes you really could use anything you want for a holiday meal but, I tried to stay along the lines of traditional with a new twist. This dish is one that I made for Thanksgiving 5 years ago from a recipe I found on Food Network. We loved it so I put it in the “recipe bank” for future use, but for whatever reason I associated it with a holiday meal only and never thought to pull it out for another night. This year I went back through old recipes to get some ideas and came across this one again. I knew immediately I wanted to make it. I knew Miss Picky Pants wasn’t going to eat it because it has artichoke hearts in it (if I had gotten rid of them should would have because she loves brie) but I figured everyone else would be game for it. I also thought it would go well with the meal because I was making standing rib roast with a garlic, rosemary crust so it fit into the slight Italian theme I had going. You know, cooking is like getting dressed, you want everything to match and compliment each other. It sounds good at least right? The meal was a bit hectic because I hadn’t planned the times as well as I had for Thanksgiving, plus the roast took up the whole oven so I couldn’t sneak things under or along the side. But this dish really comes together well. A few steps, but well worth it, trust me!! I can guarantee I wont be saving this for the holidays anymore. Special occasions maybe, but it is too good to only pull out once in a while! Preheat the oven to 350 degrees F. Grease a 9 by 13-inch baking dish with 1 tablespoon olive oil. Bring a medium pot of water to a boil. Add the spinach and cook until just wilted, about 30 seconds. Drain and rinse with cold water. Once cool, squeeze as much water from spinach as possible then roughly chop and reserve. Heat 1 tablespoon olive oil in a large skillet over medium-high heat. Add the onions and cook until golden brown and tender, about 5 minutes. Add the garlic, 2 teaspoons of Italian seasoning, 1/2 teaspoon salt, and 1/4 teaspoon pepper, and cook, stirring, until the garlic is fragrant, about 30 seconds. Add the artichokes and cook, stirring, another 2 minutes. Remove from the heat and reserve. Combine the eggs, cream, milk, lemon juice, remaining 1 tablespoon Italian seasoning, remaining 2 teaspoons salt, and remaining 1 teaspoon pepper in a large bowl. Whisk to combine. 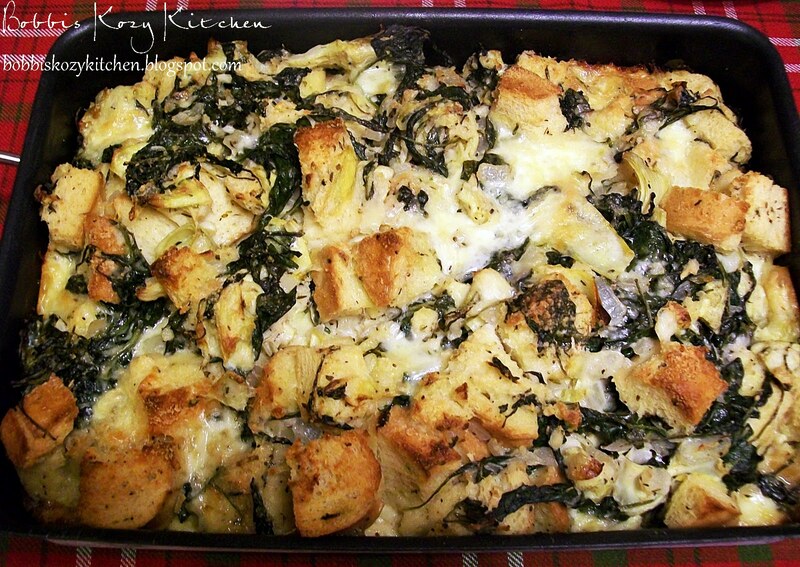 Add the bread, spinach, artichoke mixture, brie, 1/4 cup Parmesan, and parsley and stir to combine. If bread does not absorb all of liquid immediately then let rest until this happens, about 20 minutes. Pour the bread pudding mixture into the prepared dish. Sprinkle remaining 1/4 cup Parmesan over the top and drizzle with remaining 2 tablespoons olive oil. Bake until firm in the center and golden brown, about 1 hour. Serve warm.